More than a decade of ascents and counting: As autumn leaves fall and snow flurries fly, our R1® Hoody sees even more mountain time. Its highly refined high/low interior grid fabric (Polartec® Power Grid™) – redesigned exclusively for Patagonia to be even lighter and more breathable – warms, stretches and compresses incredibly well, while offering durability and a terrific feel. 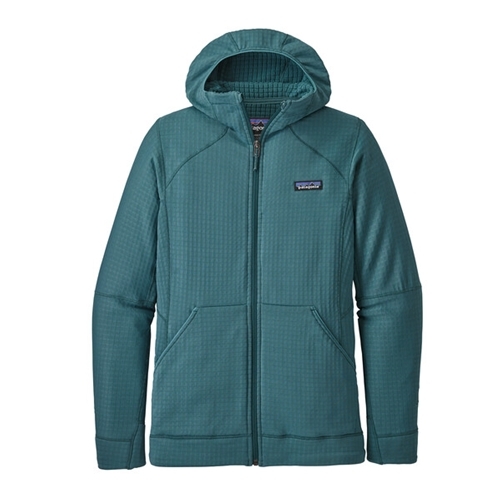 The feminine silhouette and design include the pared-down detailing that backcountry pursuits demand: a deeper front zipper with a comfy zipper garage that’s easy on your chin, discreet, on-seam wrist-warming thumb loops, and a snug-fitting balaclava-style hood. Other features include raglan sleeves for pack-wearing comfort, Variable Conditions Cuffs with spiral-stitch construction that let you push up your sleeves without constricting your forearms, a long torso for layering under a harness, and Polygiene® permanent odor control. Fabric is bluesign® approved.